The majority of people who have dogs resolve themselves to believe that dogs "just come with bad breath". This could not be further from the truth. 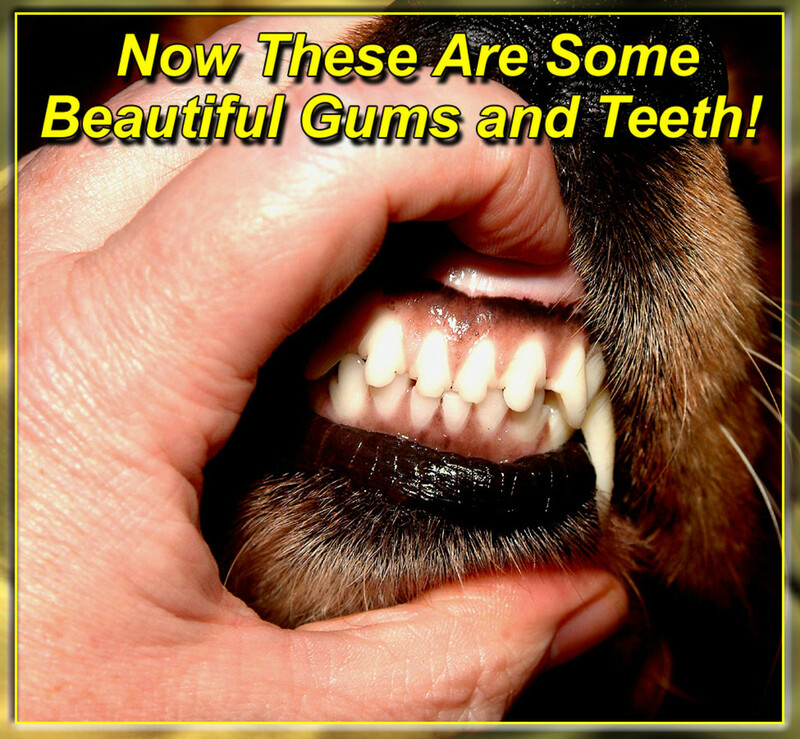 Tooth and gum problems are the most common medical problem in dogs. Close to 85% of two-year-old dogs show some sign of gum disease. 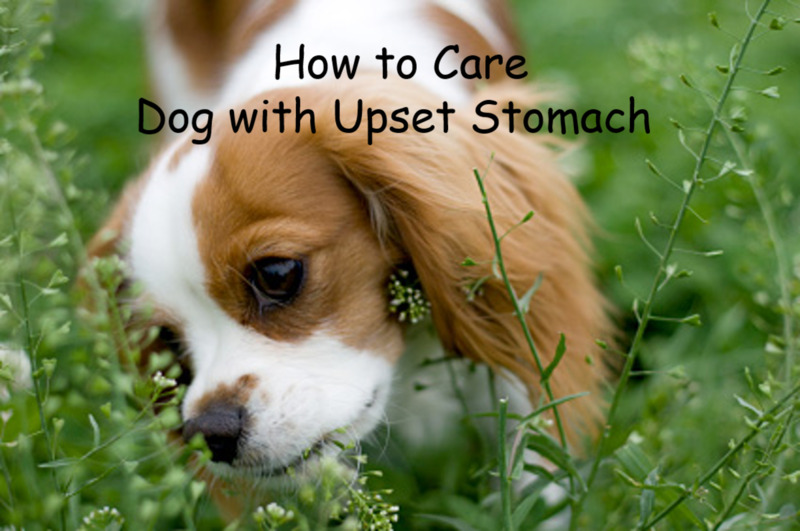 Because the mouth is actually the very first step in the digestion process, it is considered to be the clear indicator of just how good a dog's health really is. Would you consider brushing your dog's teeth? Yes. I will consider doing it. Brushing sounds like a good way to keep my dog healthy and free of bad breath. Not really. I would give my dog hard chewy toys to help condition his gums though. No. It just sounds crazy to brush a dog's teeth. If a dog's gums and teeth are not exercised regularly, plaque will build up on the surface of the teeth. This plaque build-up pushes the gums away from the tooth's surface—increasing the margin between the gums and teeth. 80% of plaque is made up of bacteria, leaving the rest of it to be made up of tiny leftover food debris and saliva. Your dog's diet and plaque formation are directly related; some say wet foods contribute to the production of plaque more so than dry crunchy Dog foods. By having our dog simply chew on (not swallow) firm rawhide products, the plaque production on your dog's teeth can be reduced by 25%. (Be sure to take away any rawhide that becomes flabby—it becomes useless and can grow very nasty bacteria). If left unchecked, plaque will build up on your dog's teeth, turning into hardened tartar that you can actually see. Tartar will widen the gap between the gums and teeth, which is a perfect environment for bacterial growth! The saliva is unable to make it through the tartar to flush the area. This allows the bacteria to build a life deeper and more harmful in your dog's mouth. 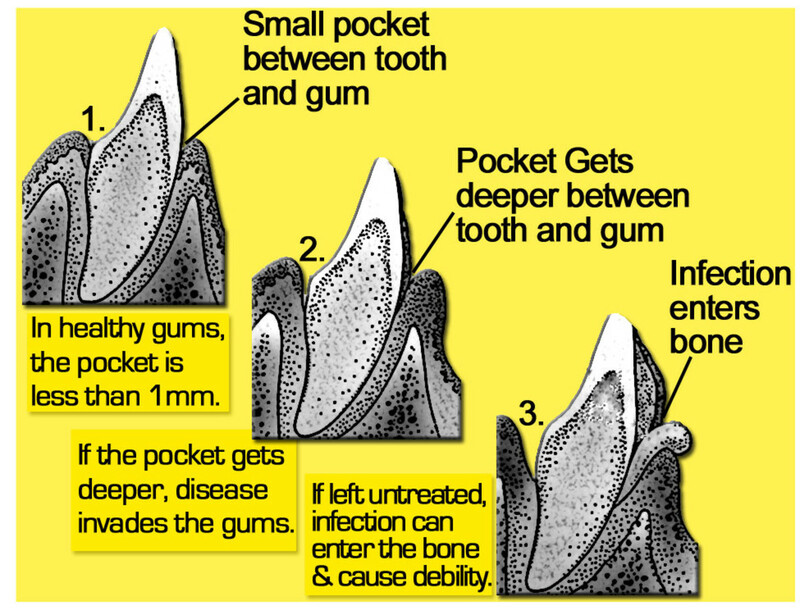 If this situation is left unattended, the gums decay and become ulcerated, the bone breaks down, teeth loosen and eventually fall out. Should Dogs Have Real Bones? Chewing on the skin and bones of prey is good for keeping the jaw muscles in good shape, and also cleans a dog's teeth. Whether you should give your dog real bones is still a great debate among dog experts and vets. Raw bones are less likely to splinter than are cooked bones, it's true; but they do have the very unhealthy and life threatening concern of Salmonella bacteria. Hard-cooked bones can fracture teeth, and swallowing bones is a common and painful cause of intestinal blockages in dogs, which often need surgery. If think you want to give your dog real bones, you must introduce them early in life so the dog can master how to chew thoroughly. Never give an adult dog bones for the first time, they simply don't have the know-how to handle them. Due to their non-acidic saliva, and low-carbohydrate diets, bacteria can't stay attached very well to a dog's tooth surface enamel. K9s do in fact get cavaties, but it is a pretty rare occurrence. If you find out that your dog has one or two cavities—I would be inclined to check the candy bowl for paw prints! Only use dog specific toothpaste on your pet. 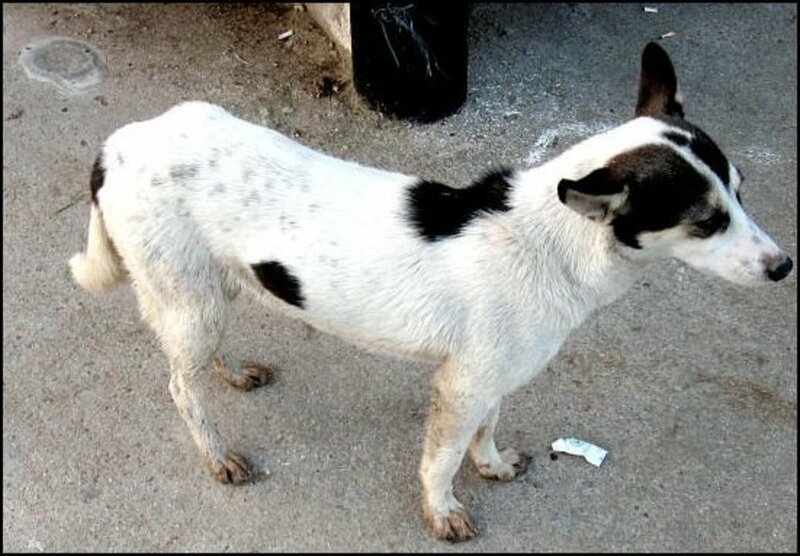 Never use human toothpaste on your dog. If too much fluoride is swallowed it can make your dog sick. Be patient and allow the dog to get used to the taste and having you working on his mouth. Get your dog familiar with teeth scrubbing by first using your finger, then next time use gauze, then finally work up to an actual toothbrush. Brushing the outside of the teeth is most important, but if you can manage it, get the inside as well. The video below shows you just how to get this dental care underway, and in less than 2 minutes! Learn How to Brush Your Dog's Teeth in minutes! No matter how old or how bad the condition of your dog's teeth and gums have become, it is never too late to begin a healthy canine dental care program. The health of your furry friend depends on you to take action! There are several ways to contend with your dog's dental care needs, the chart below can give you a few ways to approach your canine's gum and mouth condition. 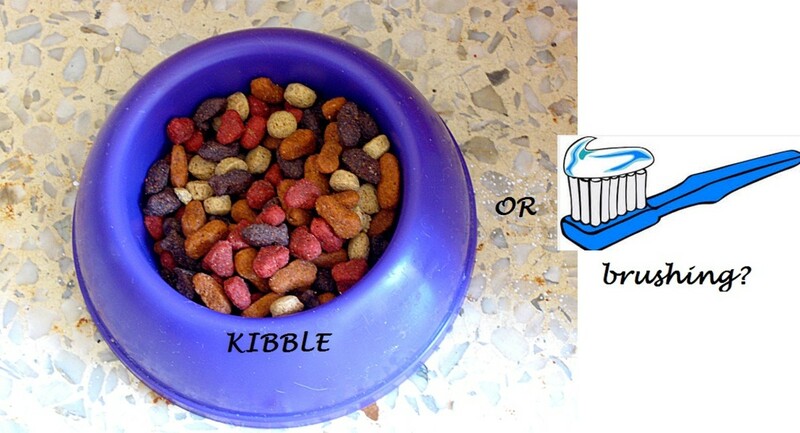 Does Kibble Really Clean Your Dog's Teeth? Comments for "Canine Dental Care"
Hi, I always learn something new when I read your Hubs. You do such a great job with your research and formatting of your Hubs. Thanks for all this info. Voted UP, etc. Pamela99~ I have tried to brush our cat's teethe, in doing so, I learned that this process is best left to our vet! But her teeth are very pretty. Thanks for making it by Pam, I so enjoying seeing you here. AJRRT~ I am so glad you stopped by, Welcome to HubPages! I hope you find your experience here fun and fantastic! Thanks for sharing your comments. Sunshine625~ lol! Maybe you can clarify the dental drill topic for my dog!? He is not that thrilled with me brushing teeth either, but he knows that a treat is waiting in the wings! Thank you for sharing your comments. Although I'm a cat person, this was really informative and now I know how to brush my friends' dogs' teeth. Thanks! Voted up and gross... I mean, interesting! 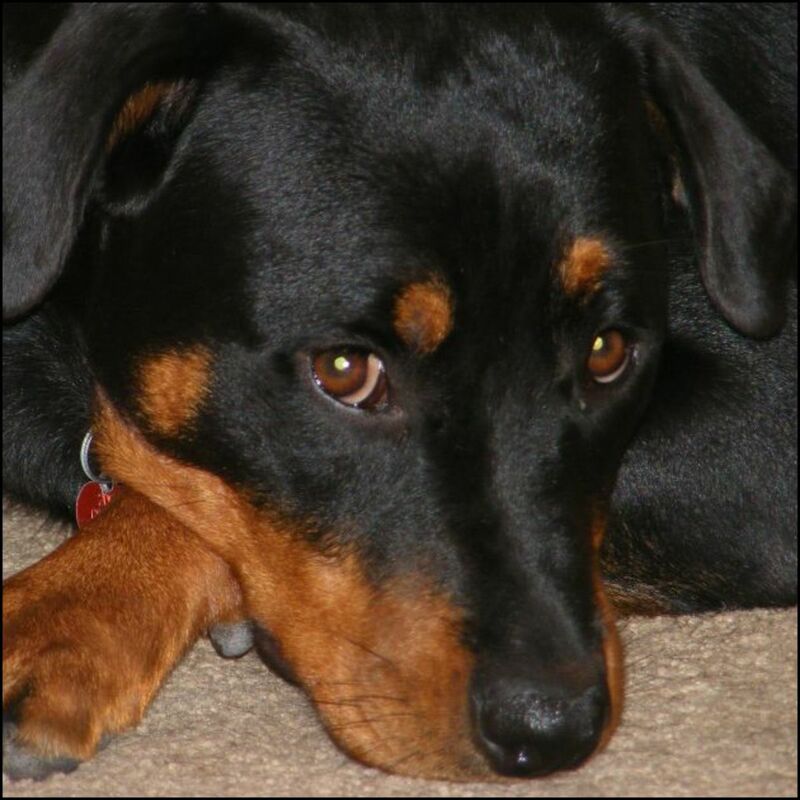 Excellent detailed information that is very important for your dog. We even get our cat's teeth cleaned. Rated up and useful. WOW! Great article and so detailed and informative. Voted up, voted useful. I am new to HubPages. After reading this article, I will definitely be following you. Cardisa~ You know a lot of people don't really think about their dog's dental hygiene. But it has a huge effect on their health. 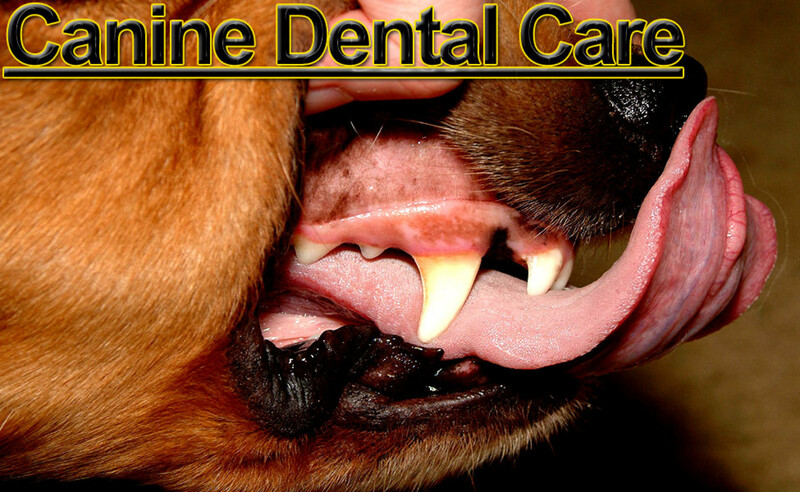 Teeth and gums are a direct indication that something is either wrong, or that an animal is in good condition. All of that bacterial build-up can reek havoc on an immune system! Thank you for making it by for a doggy dental read, I appreciate your time! Shesabutterfly~ Oh, I just LOVE puppies! I hope she is bringing you tons of entertainment and joy! "Dog Ate Rawhide: Dangers of Eating Rawhide Bones and Signs of Trouble". I hope you and your puppy have a super long and healthy life together! brittanytodd~ Thank you for your kind remarks ma'am. I guess dog bad breath is a pretty gross topic. It's funny, I almost titled this hub 'Why Does My Dog Have Such Gross Bad Breath'...but decided against it! lol! I sure appreciate that you made it by today. Wow, I never took the time to learn about this before, but I do know that dry food and crunchy stuff are good for their dental health. No I am a little freaked out about the receding gums thing. I can imagine how painful that must be. My puppy just turned a year and she has perfect teeth and fresh breath, so I'm hoping to keep it that way. You mentioned not swallowing rawhide material, is this bad for the dog? This is a very informative article and I will be sharing it with my friend whose dog has terrible breath. Maybe this will open him up to asking the vet about problems his dog could be having. I know his dog's breath didn't always smell as bad as it does right now. This was gross, but very informative and well-written, K9keystrokes! I always think your articles are formatted so well. You did some great work here. Excellent research, voted up, useful, etc.